Each and every person has a kitchen in their house. This is the most important place in the house. The kitchen has to maintain properly with cleanliness. But, cleanliness is not only sufficient for a kitchen. The kitchen must also have to be decorated like all other rooms in the house. Using decorative ideas in the kitchen will make your kitchen beautiful. This will give energy to one those who work in the kitchen. Following are some of the kitchen decorative ideas one can employ in his/her kitchen. A kitchen should have a thick and dense lighting facility. This is because cooking requires a bright environment. Using densely scattered lights on the ceiling are will give a good look to the kitchen. They are discrete and effective. Similarly, users can mount those lights anywhere they need. Use halogen lights in the kitchen - The next idea is to use halogen lights in the kitchen. This halogen lights will make wonders in the kitchen. Use decorative colors in the kitchen – A colourful kitchen will give innovative thoughts to the person. Similarly, people won’t get bored of working in the kitchen if it is colourful. While using colors in the kitchen, people have to use good and exploring colors. This is because using light colors will get damaged by some kitchen things. Use decorative flowers in the kitchen - Plants and flowers add lively decoration to the kitchen and are good for the environment. Add a functional decoration to your kitchen by creating a window box with fresh herbs, or replace fresh-cut flowers in a kitchen table vase every few days to keep it looking new. Alter the linens. One way to give the whole kitchen a unified theme is to choose one pattern for curtains, tablecloth, and hand towels and create a matching set of linens. The only hard part of this is committing to just one. Using the same kind of cloths for curtains, table cloth and hand towels will give a good look to your kitchen. Change decor periodically - Keep changing out the kitchen linen, curtains, or dishes for special holidays. Alternate these items, which all complement the personality of your kitchen, with the changing seasons to add seasonal colors and elements. This will get complements from others and make the kitchen beautiful. Clean your kitchen daily – This is the most important thing anyone should do for maintaining their kitchen decor. Cleanliness is very important for a kitchen. Simply, cleaning the kitchen with cleaning materials will give a perfect finish to the kitchen. Maintain neatly ordered shelves and furniture – A kitchen contains a number of shelves and furniture. One should neatly arrange things on the shelves. This will eliminate confusions and able to get things easily. Similarly, one has to concentrate on the furniture arrangements of the kitchen. 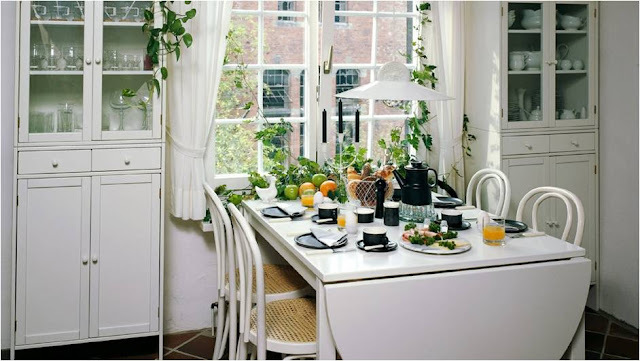 Maintaining a neat arrangement of furniture is enough to make good look to a kitchen. The beauty of a home lies in the beauty of its kitchen. Hence one should maintain their kitchen with these decor ideas neatly.